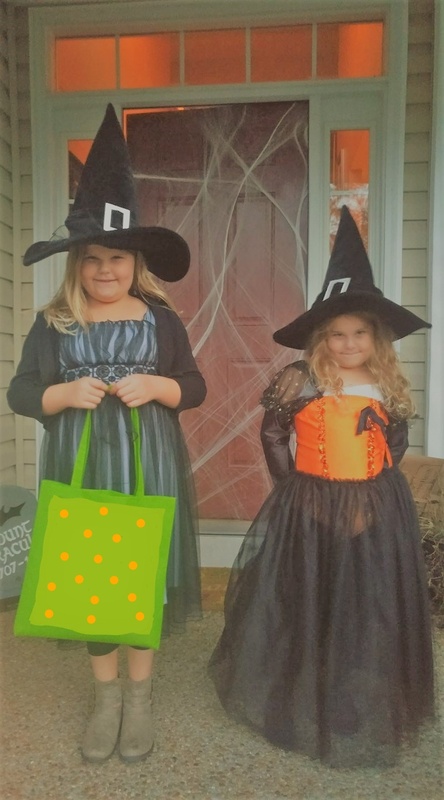 From candy to pumpkins to the costumes, Halloween is a fun-filled time for kids and adults alike. However, it can pose dangers. To help make this year’s trick-or-treat a safe and fun time, follow these simple safety tips complied by the American Academy of Pediatrics. Plan costumes that are bright and reflective. Make sure that shoes fit well and that costumes are short enough to prevent tripping, entanglement or contact with flames. Because masks can limit or block eyesight, consider non-toxic makeup and decorative hats as safer alternatives. Hats should fit properly to prevent them from sliding over eyes. The makeup should be tested ahead of time on a small patch of skin to ensure there are no unpleasant allergies on the big night. When shopping for costumes, wigs and accessories look for and purchase those with a label clearly indicating they are “flame resistant”. If a sword, cane, or stick is a part of your child’s costume, make sure it is not sharp or long. A child may be easily hurt by the accessories if he/she stumbles or trips. Review with children how to call 911 if they ever have an emergency or become lost. Small children should never carve pumpkins. Children can draw a face with markers. Then adults can do the cutting. Candlelit pumpkins should be placed on a sturdy table, away from curtains and other flammable objects, and not on a porch or any path where visitors may pass close by. They should never be left unattended. Adults should check outdoor lights and replace burned-out bulbs. Wet leaves and debris should be swept from sidewalks and steps. Restrain pets so they do not jump on or bite a trick-or-treater. A responsible adult should always accompany young children during their neighborhood trick-or-treating. Obtain flashlights with fresh batteries for all children and adults. Do not assume the right of way. Motorists may have a hard time seeing Trick-or-Treaters. Just because one car stops, does not mean others will! A good, healthy dinner prior to parties and trick-or-treating will discourage children from filling up on Halloween treats. Consider purchasing non-food treats for those who visit your home, such as coloring books, stickers, or pens and pencils. Try to ration treats for the days and weeks following Halloween to prevent overindulging, which will lead to a stomachache and ruin the night’s fun. Make sure the Halloween night is fun and safe with the suggested tips above. These tips will help guarantee you all a ghoulishly good time. 4-H Day of Service- Peanut Butter Anyone? Did you know that the Saturday of National 4-H Week is the 4-H Day of Service? 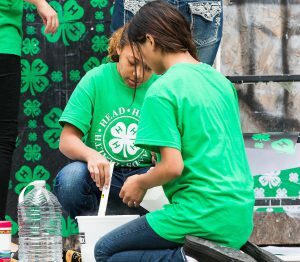 4-H Clubs across the nation will be celebrating National 4-H Week with “hands to larger service.” Service is a huge part of the 4-H program (one of the “H”s”) and also helps teach youth compassion for others. 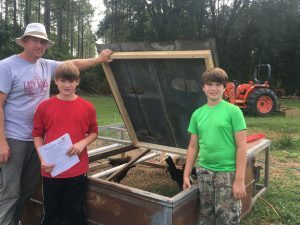 Service is also a requirement in order to maintain a 4-H club charter. Younger youth typically start out with community service. Community service is volunteering in your community. This is usually done through food drives, such as the Peanut Butter Challenge, or volunteering at an animal shelter, collecting coats or blankets for those in need, or a toy drive during the holidays. 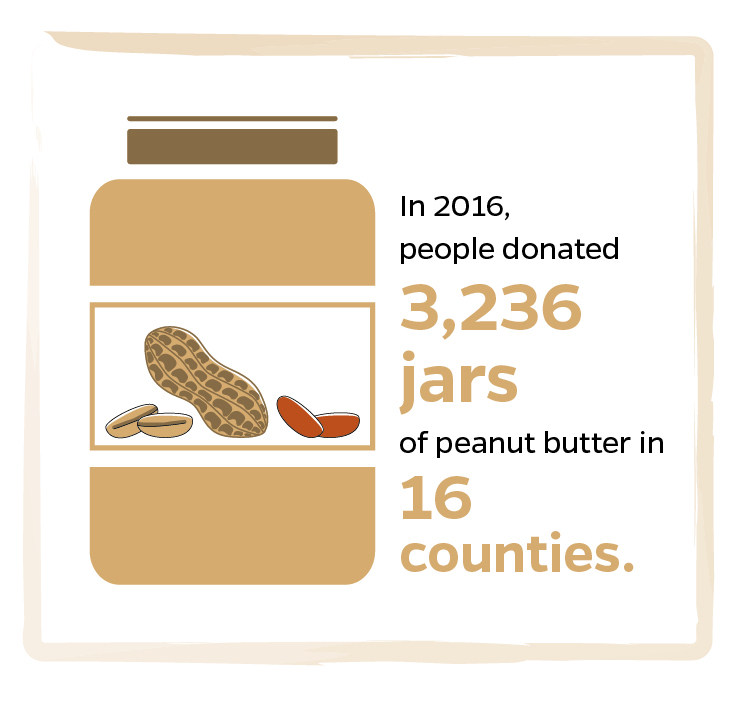 If you are looking for an easy but impactful service project for your club, I would encourage you to participate in the Peanut Butter Challenge. 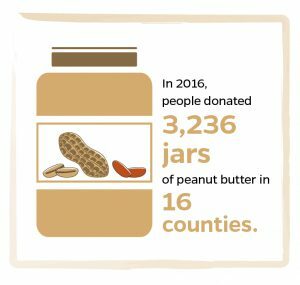 Each county in the panhandle is collecting jars of peanut butter to donate to local food pantries. The Florida Peanut Producers will match the donation of the county that collects the most peanut butter. Contact your local UF IFAS County Extension Office for more info or refer to this flyer. Older youth are encouraged to move from community service to service learning. What’s the difference? Service-Learning is more than a “one-shot deal.” Instead of spending a day or few hours helping someone, youth identify a need, and develop a strategy to address it. It also incorporates reflection and celebration. Service-Learning projects take community service to the next level by emphasizing both service and learning and is more meaningful for older youth. Community Service – Youth prepare and serve a meal at a local homeless shelter. Service-Learning – Youth research homelessness in their community and contact local homeless shelters to learn about the types of services they provide. Youth then decide together on a service project that will support this community need. After planning and completing the service project, youth reflect upon both the Service-Learning process and the service project. Did you know Florida 4-H has a state service project selected by our youth executive board? 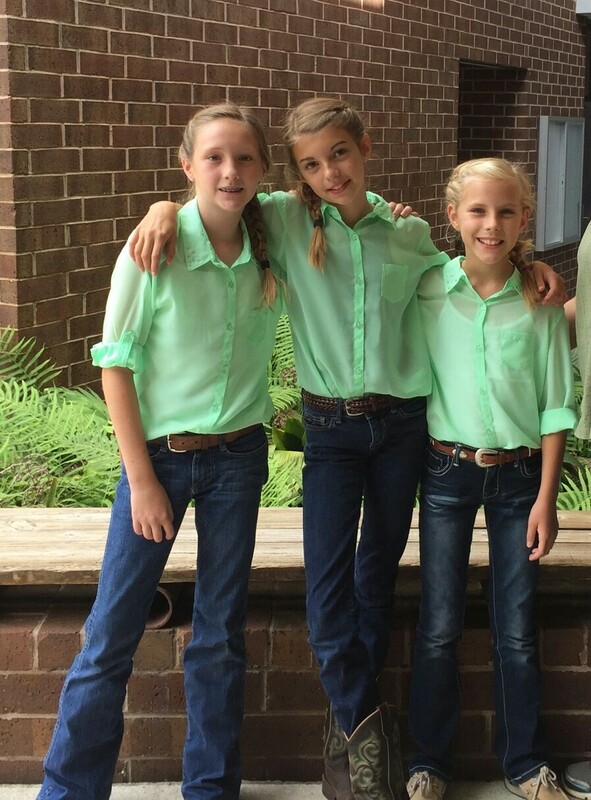 Each year the State Project Committee of the Executive Board recommends activities in which 4-Her’s can participate that will carry out the state wide community service project of the Florida 4-H Council. This year, the committee decided that the theme for 2017-2019 will be “Living In Florida’s Environment (LIFE)”. This project is focused on creating a greener tomorrow by hosting beach cleanups, planting trees, and participating in citizen science activities. Youth can receive recognition for their service efforts at 4-H University. It is also a requirement for the District 4-H Spirit Stick Awards. The State Project Committee encourages all youth to participate in at least one state project that is associated with LIFE. The committee would also like to recognize the youth that do participate in these projects. Once a project is completed, please record it on the project report-back sheet found in the tool kit below. These record sheets will need to be submitted to Grace Carter by July 3, 2018. The committee would appreciate if pictures were included in these reports. The report form can be found in the LIFE Service Project Guide. Bronze: Youth who complete 1 service project will receive a bronze certificate of completion. Silver: Youth who complete 2 service projects will receive a silver certificate of completion. and will also receive recognition at 4-H University 2018.
of completion and will also receive recognition at 4-H University 2018. From its beginning, the 4-H program has used a system of clubs and competitive activities to promote learning and the development of specific skills of 4-H members (Ladewig & Thomas, 1987). Sometimes competition is viewed negatively. 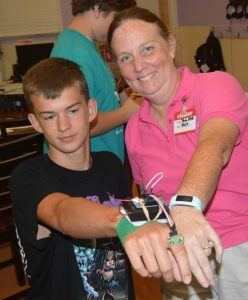 Florida 4-H does not believe that competition is beneficial for youth under the age of eight, but for older youth, competition can help promote the development of life skills. When you break it down, competition is simply the process of comparing skills (Midura & Glover, 1999). Competition provides opportunities for youth to master and demonstrate life skills that can be used in the real world. For example, livestock judging participants learn more than animal science- they learn about the ethical treatment of animals, how to communicate and critical thinking. Weber and McCullers (1986) stated that “young men and women who traditionally attain the highest levels of achievement in the 4-H program are typically very successful ‘in other aspects of life as well.” Other studies have also shown that competition helps to decrease juvenile delinquency, foster responsible social behavior, stimulate creativity, motivate young people to set goals, prepare them for the competitive world and gain important life skills. Competitions involving judging are beneficial educational tools used to prepare youth for the workforce, regardless of their chosen careers. Former participants have learned to become team players, which is essential to their success and efficiency in the workplace. Teambuilding skills are an essential element of success at any age. 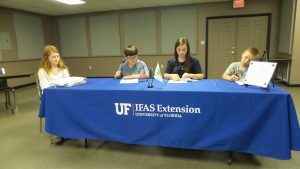 To learn more about competitive opportunities in 4-H, or how you can become involved as a coach or project leader, contact your local UF IFAS County Extension Office or visit http://florida4h.org. The very word meeting makes me sigh and roll my eyes. I’ve been to so many that are a waste of time and energy and, let’s face it, boring! Are they ever really productive? Can’t they (please) be more interesting? Meeting is just another word for get-together, assembly, encounter, engagement, rally or reunion. When 4-H Clubs follow the club meeting model, meetings can actually be fun! 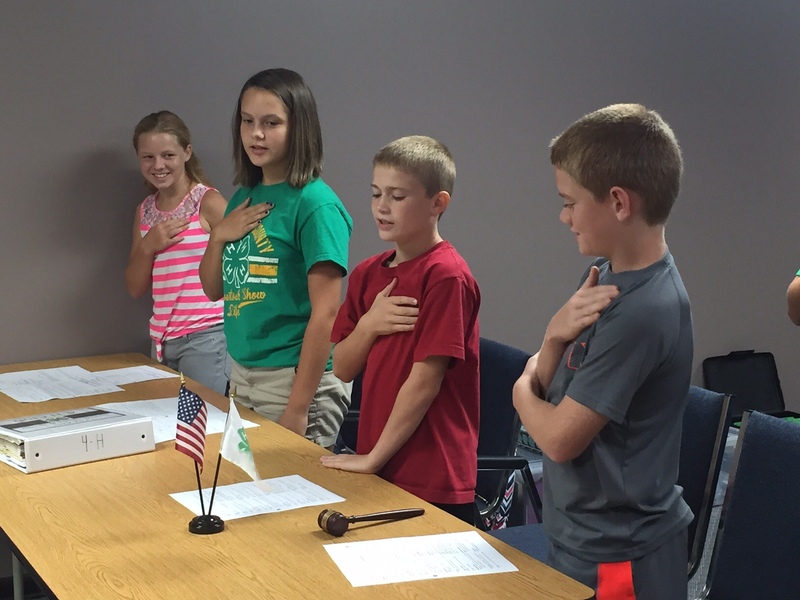 The 4-H Club meeting has three distinct parts: business, recreation and educational program. Business should take up 25% of the agenda, the educational program 50% and recreation 25% of your meeting time. 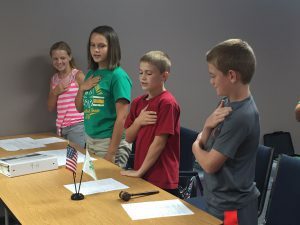 The order of your 4-H Club meeting isn’t set in stone; club officers and leaders can be creative in how they set up the agenda for each club meeting. There’s no way around it; 4-H Clubs have business that needs to be dealt with including roll call, secretary and treasurer reports, committee reports, old and new business and announcements. It’s tempting for club leaders to take over and do this part of the meeting, but our youth learn nothing from this! Some of the most useful skills youth develop come from getting ready for the actual meeting and leading their peers in an organized setting, and as an adult, it’s really cool to see youth get things done efficiently. 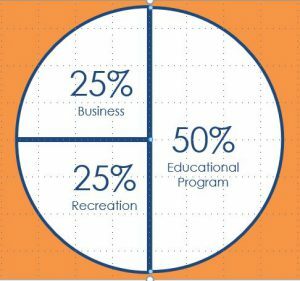 It’s also important to remember that business doesn’t have to be conducted at every 4-H Club meeting. For clubs with younger youth, you can have them lead the pledges. 4-H Club members share what they’re doing with their projects. Take a short field trip. Practice for judging contests or do a skill-a-thon. Work on a community service project. My co-worker, John Lilly, has a tag line on his email signature – Jefferson County 4-H is the place where there’s fun in learning and learning in fun! I firmly believe that the club that plays together stays together. Why? Because kids are going to want to come back, volunteers are going to stay engaged and most importantly, the parents will bring their kids back. Recreation helps kids make new friends and learn important social skills. Whether it’s through songs, ice-breakers, games, team-building activities or food, don’t forget to inject fun into 4-H meetings. As a club member, leader or parent, you can help your 4-H Club avoid these three dysfunctions. Good 4-H Club meetings help youth make new friends, develop social skills, increase confidence and leadership and make decisions. To learn more about 4-H Club meetings, visit the florida4h.org and explore our Volunteer Training Series. The information here is great for club leaders but also for youth leaders and parents.